Our interns Stephanie Confer and Dan Kubacki sat down with Executive Director Ferki Ferati to pick his brain over the Jefferson Educational Society. The Jefferson Educational Society will soon be in full swing beginning Tuesday, July 12 for its summer session. Erie Reader recently sat down to talk with the Executive Director Ferki Ferati. What did we discuss? Mainly the Jefferson Society and its progression in Erie since it first began three years ago, but also the man himself, his journey to Erie, and why he likes it here. 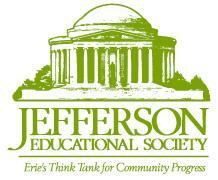 Erie Reader: How was the Jefferson Educational Society started? Ferki Ferati: The idea came up in early 2008 from a few Erieites, all of whom are on our board. They decided that most progressive communities have some sort of a think tank that is oriented towards educating the public at large and doing research for community progress. This research seeks to answer questions such as what's right and wrong and what is the nation doing that Erie could implement in the future? ER: How long has the JES been in operation? FF: We opened October 1, 2008. In our first term, we had an open house and brought in about 162 people, as I remember. And our most recent term we brought in 700. We've had quite a rapid growth since then. ER: Who decides which speakers are presented? FF: We have a program committee, and we take suggestions from anyone who wants to teach, whatever they want to teach. We don't do "how-to" classes. It's more of philosophical questions, as in "why?" or "what happened?" For example why did the Roman, French, and British Empires fail? And is America heading the same way? We try to have a broad range of programs. ER: How did you get involved with the JES? FF: I was not part of the original idea. I was brought in as a researcher to do the research whether this type of institution was needed. Then about a year later I was promoted to do the executive director's job. ER: Is there anyone specific you still want to bring in for a lecture? FF: Absolutely. This year we're having Michael Haden, the former CIA director and NSA director. We're bringing in Alice Ridlin, who was the former head of the federal budget. And we're bringing in Francis Fukiama, a best-selling author from the New York Times. But who do I want to bring in? That depends. I want to bring in Paul Krugman. David Brooks. As far as famous figures? Probably next year we'd want to go after someone like Tony Blair. That's one of the people we're thinking about. Locally, we have the summit, which is once-a-year, and we bring in nationally-known speakers, like Paul Kennedy and EJ Dione. Whoever wants to teach, we examine them and determine if they fit into the mission. ER: Now that the JES is three years in, what's the outlook for the next couple years? FF: Next Thursday at noon at the Sheraton we're going to announce the Perry 200 Commemoration, which is a 200-year commemoration of the Battle of Lake Erie during the War of 1812. One of the most successful battles was fought out on Lake Erie, outside of Sandusky, Ohio. But the fleet was built right here in Erie, when we were only 500 people. For that celebration, we are going to introduce Erie history into the schools, and we're going to have all sorts of events that will celebrate the heritage of the Erie area. In terms of the Jefferson itself, we plan to continue to offer our programming, enrich it, and bring in more people from the outside on a regular basis. We plan to have an Erie Civic Journal, which will come out semi-annually, where we will publish great ideas or study Erie issues. ER: How do lectures given by local speakers differ from those given by national speakers? Is there a difference in the crowds that are drawn? FF: We want to educate as many people as we can in anything that we can. We don't want people to go and pay $2,300 to take a college course when they can come and learn just as much for 10 bucks an hour. We're also offering free classes so anyone can come in. Father Kriegel brought in 230 people. That's quite a number of people wanting to learn. One of the things that we found is that Erie has a huge intellectual appetite – something that's vastly underrated. We've had 2,300 unique individuals here at the Jefferson in the last three years. And if we can increase that to about 5,000 or 10,000 different people, then we'll have this pool of interested citizens, which we could push for progressive change. That's the broad mission: that we can educate people, deliberate with them, come up with ideas, and organize the thought process of this community. And then we can do something about it. ER: Do you do any work with Erie schools or the colleges in the area? Do you have any plans to branch out to the younger crowds? FF: Absolutely. We've had students from Collegiate Academy come and take classes on world issues or what's going on with the economy. So we do want to expand that. Our classes are from 7 to 8:30 at night. That's one of the challenges we have to fix. But we want to increase youth attendance. For the summit, we're promoting the event to professors on college campuses. But on a day-to-day basis there's not much you can do. There are colleges who have events right on campus. But we realize there are limitations. ER: How did you yourself get to Erie?/Tell us about yourself. FF: I am originally from Kosovo. I came here in 1998 after a war in Kosovo. I came here as a refugee at age 16. I went to Mercyhurst Prep and Mercyhurst College, and now I'm going to Gannon. ER: What do you like about Erie? Have you ever thought about living anywhere else? FF: You mean move? Never. Never entered my mind. It's a great place to be, and I have so many friends here. I went to San Diego a couple months ago. Beautiful right? I thought to myself that if I lived there I would never do anything – I'd just be outside all day. Erie is a great place to live your daily life. That's what vacations are for. To go to places like that. We need to be more friendly to people our age. And we have started to do so. We have organizations in Erie that are keeping young people here, like the Black Family Foundation, Erie Reader, and the Jefferson Society. We want to keep young people here, and that's one of the challenges the community faces. We're doing that, but we can only change so much so fast. ER: How often do you visit Kosovo? What's your family like? FF: I go usually every couple years. It feels like home but then I come back here. I have a sister who has three kids, so it's always a great time to visit her and her kids. I have a couple of brothers in Slovenia. I have another sister in San Diego. There's six of us, and our parents. ER: Do you have a favorite place you like to go in Erie? FF: I love the Bayfront, especially in the summer. I like to take Sunday lunch at the Crazy Parrot in North East. I like the Sheraton too. FF: The Jefferson is a very exciting place to be and come learn. We offer things for everybody.